1. 설탕유리가 머리에 맞아서 깨지는 1/6000초를 사진으로 기록. 2. 깨진 설탕유리의 사진을 인체캐스팅에 피부처럼 씌워 공기와의 접촉으로 인해 차츰 피부의 무늬가 변하게 됨. 3. 만질 수도, 볼 수도 없는 1/6000초가 물질성을 띄고 30일로 길게 늘여지는 과정을 전시함. 1. 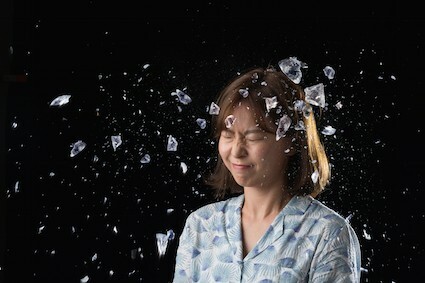 Record a 1/6000 second snapshot of a sugar-based glass that breaks into the head. 2. 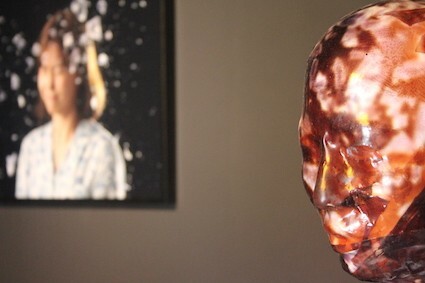 The picture of the broken sugar glass is covered like a skin in human casting, and the pattern of the skin gradually changes due to the contact with air. 3. Exhibits a process that can be touched, can not be seen, and 1/6000 second is materialized and extended to 30 days.